A: If there is static noise in one channel, normally it is caused by the tube of that channel. Maybe it has a poor contact after the long shipping process. You can open the chasis and adjust the screw near the tube while listening(contact us and we will give you a photo with marks to help you find it). Also, there is a small possibility that the tube is broken. You can buy a 5899 tube in local shops, which is very normal to see. And we will refund you the cost. Q: It broke just now four loud pops and it's dead. Very disappointed. A: Mainly because the battery is run out of power. Please charge it. If not help, please contact us. Q: The Amp has a lot of electronic feedback/interference when a cellphone is hooked up to it or nearby. It creates popping in the headphones. A: Vacuum tubes are easy to be interfered by devices that can trandfer siganl like cellphones, routers. Please keep the amp away from them. Q: Won't hold a charge, sounds like something is loose inside. A: The charger is broken. Please contact us to get a new one. 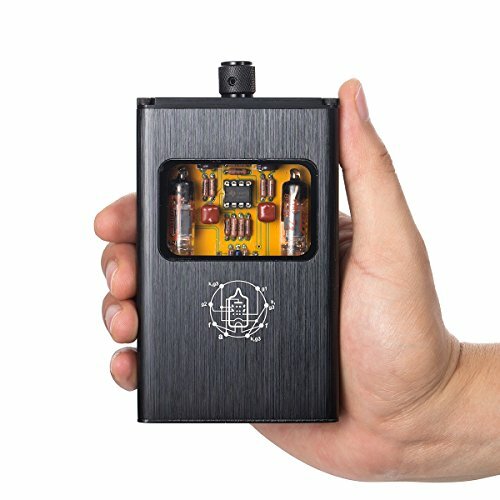 B4 is a very special portable vacuum tube headphone amp that you can hardly see on the market. Our technicians made much efforts to eliminate interference that may exist due to its portable design. For satefy reason, the device can't work while charging. Charging time: 2~2.5h; Working time: 4~4.5 h; The indicator will turn to green when charging process is finished. Due to there are microphone effects on all tubes, you may hear some signal interference noise caused by 4G, Wi-Fi. Please keep the distance between your phone and B4. B4 is a innovative tube headphone amp. You may meet some problems while using it. For any questions you have, please email us and we will try our best to make you satisfied.